TEMPE – Sun Devil Stadium has stood between two mountain buttes overlooking Tempe since 1958. The iconic stadium has gone through major expansion renovations in both 1977 and 1988. But for the first time in its history, it is going through construction to reduce seating. Previously, the stadium had a capacity of 71,706. But the capacity of the new stadium has yet to be determined, according to Arizona State University. The $256 million project, which began earlier this year, has completed its first phase of construction as the college football season kicks off. 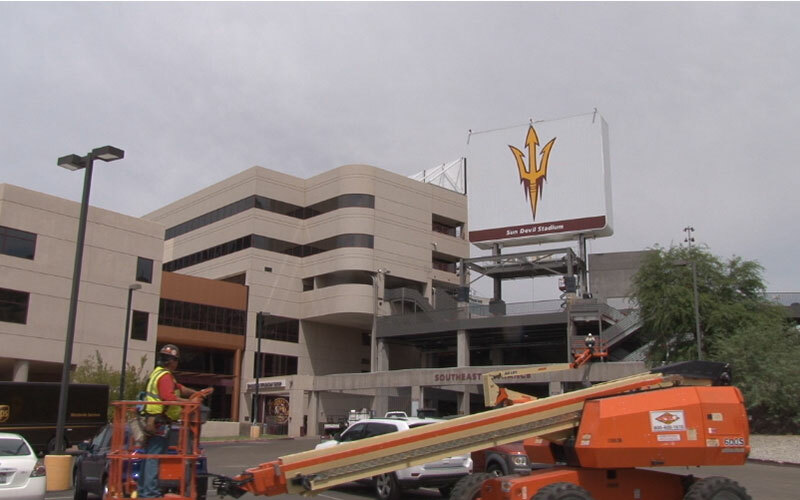 While many Sun Devil fans eagerly await the remodel, some season ticket holders – specifically those in the north and south endzones and the upper southwest sections – said they aren’t thrilled with the changes. Nearly 10,000 season ticket holders were forced to relocate their seats because of the construction. Art Taggart and his family have been season ticket holders for nearly 20 years. Taggart and his family, like many others, had to relocate their seats. But for some of his family members, the change in price or location caused too much of an inconvenience to renew their tickets. Dave Cohen, senior associate athletic director for ASU, said the athletics department implemented new technology called Molina 3D, to help the relocation process. The technology allows season ticket holders to select any available seat in the stadium and get a 360-degree view of the sightlines from that location. Cohen also said that the recent success of the football program under Head Coach Todd Graham also has affected seating. There has been an influx in season ticket sales, which makes relocating existing season ticket holders even more complicated. Cohen declined to give specific numbers of how many remaining season tickets are still available for purchase. The Sun Devils plan to play through the construction, both this season and next. The entire stadium renovation project is slated for completion prior to August 2017. ASU has its first home game of the season on Sept. 12 against Cal Poly.